Parking for several hundred cars has been made available in a field directly opposite the venue. 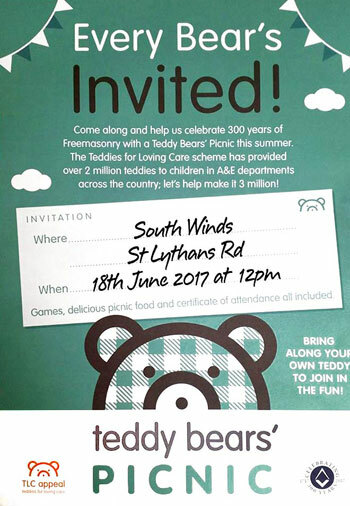 Traditional children’s games will be offered, including; guess the name of the teddy; egg and spoon; best dressed teddy; etc. Limited refreshments will be available. Our honoured guest will be the Right Worshipful Provincial Grand Master and his wife Susan; and we look forward to a most enjoyable afternoon in support of this very worthwhile course. Don’t forget to bring your favourite teddy and a picnic! Please circulate this email to all your friends, families, brethren & non-brethren. Please LIKE and SHARE on Facebook and Twitter to give this event a major boost and publicity. This entry was posted on Tuesday, May 30th, 2017 at 9:05 am	and is filed under News, TLC.